The Blessed Virgin Mary, the first and most perfect model of Consecrated Life in the Church, is the luminous icon of our life of reparation. We strive to make our attitude of obedience like that of her sacrifice, her “Fiat” at the Annunciation and at the Cross. 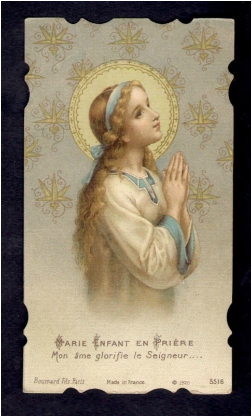 Like the Blessed Virgin we are called to respond in humble, joyful acceptance to whatever the Lord desires for us at every moment of our lives. St. Francis' call to live a life in union with our Blessed Lord who surrendered all for the salvation of mankind, serves as a model of reparation for us as we unite our lives with the Passion and Death of Jesus, offering all for the atonement of the sins of mankind. He is the patron of souls of reparation. Our life of poverty is modeled on the life of St. Francis who sought to live the simple life of Jesus who was deprived of even His clothing as He was stretched out on the Cross. St. Faustina, the Secretary of Divine Mercy was canonised in the year 2000 by our Holy Father, Pope John Paul II and is a wonderful example of a life of reparation. Her diary, Divine Mercy in My Soul, gives deep insight into God's wonderful mercy and His desire that not one soul be lost. Her humble life reminds us how God looks with favor on His lowly servants, exalting the humble who look towards Him in faith and obedience. St. Michael and all nine choirs of Angels are specific patrons of our religious community. St. Michael, is exalted because of his outstanding zeal for the glory of God and the salvation of his fellow angels at the time of Satan’s rebellion.His very name means “Who is like God” and he is our protector against the wiles of Satan especially in our teaching ministry.